The Bitspower G1/4 Black Sparkle CaseTop Water-Fill SET acts as a Pass-Through Fitting. It is ideal for sectional water cooling cases like using solid bottom panels between a pedestal or dropping external water cooling lines outside your case. Both ends of the connectors are G1/4 female ports. 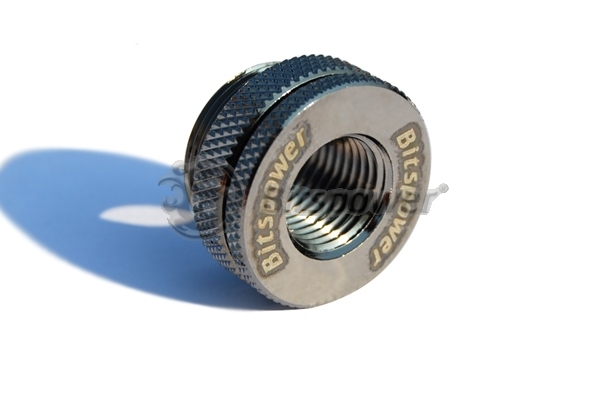 This allows you to use a fitting or stop fitting on either end giving the part versatility. Use it for fill port, drain port, or pass through. The G3/8" male fitting on one end also allows one to use it as a G3/8" to G1/4" converter as needed with Thermochill radiators.